Plans are in train to send British Army Reservists to the north of Ireland to deal with the consequences of a crash Brexit at the end of March. 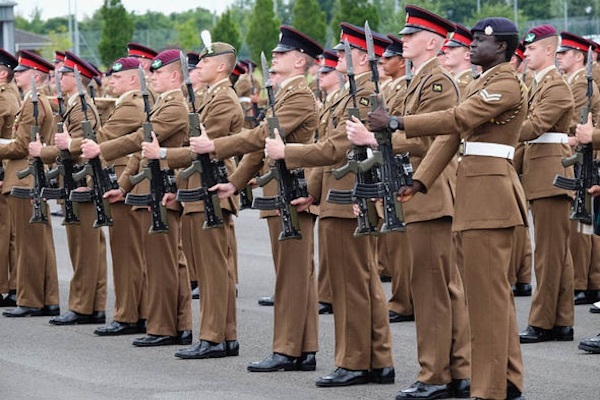 The Tory Minister of State for the British Armed Forces, Mark Lancaster, told MPs that reservists would be deployed “throughout the United Kingdom” as Britain looms closer to falling out of the European Union, taking the north of Ireland with it. An unknown number of reinforcements are be deployed to Ireland beginning on February 10, 2019. According to the Minister, their role will be to protect the “welfare, health and security of UK citizens and economic stability of the UK”. There was strong criticism of the move on both islands. British Labour MP Ian Murray said it was “staggering” that British reservists are being activated because of the risk of a constitutional crisis of the British government’s own making. Sinn Fein South Down MP Chris Hazzard said it showed how chaotic the British Brexit policy had become. “No government can seriously claim that any policy that results in the need to deploy soldiers onto the streets is a good one,” he said. Meanwhile, unguarded comments by two Irish Ministers as they discussed plans to introduce customs controls after Brexit have also caused alarm. The Dublin government had consistently claimed it is not preparing to introduce a border through Ireland in any circumstances - deal or no deal. Mr Coveney also said border checks “could be at sea”. Mr Ross then said, “yeah, but I didn’t know what to say” . The private exchange led Fianna Fail leader Micheal Martin to say a “private understanding” now existed that border checks were in prospect. He called the taped conversation “deeply worrying”. Saoradh’s Packy Carty said that it was “astonishing” that the partition drawn up and manned by the British for almost a century might now be imposed by a Southern Irish administration. “This weekend marks the centenary of the foundation of the 32 County Irish Republic,” he said. “Britain through imperial might, state violence and the threat of war eventually forced on the Irish people two states, that to this day usurp the Republic of 1919 and continue to deny the Irish people democratic self-determination and sovereignty.